[Genoa] In another example of unequal treatment among unequals, Cardinal Tettamanzi of Genoa, according to Messinlatino, has neglected to deal with Father Andrea Gallo and his partner in crime, the "peace" and abortion priest, Don Andrea Gallo, despite the vociferous objection of many of the Faithful. Every Archdiocese seems to have a handful of these more outspoken creatures who go unpunished, and are well-fed, while their more traditional counterparts face expulsion, suspension and the contempt of their superiors and colleagues. Heretical Fr. Andrea Gallo has concelebrated Mass with Genoese priest, Gino Paoli, recently where he sang "Bella Ciao" a disrespectful anthem to the Blessed Mother. 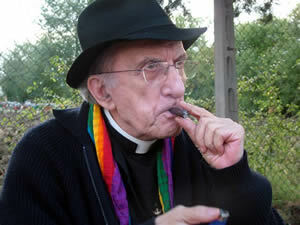 After his shocking confession that he's helped prostitutes to have abortions in the Corriere Della Serra a few years ago, his recent blasphemies during Mass with Father Paoli, Don Gallo's admission might seem rather low key for now, almost an afterthought put on the back burner by Cardinal Tettamanzi, who never the less saw fit to threaten another priest, the late Christian Democrat, Don Baget Bozzo, who'd criticized him quite lightly in the same day as Dom Gallo's aforementioned admission to Corriere Della Serra. In any event, the duo were able to promote their peace message of disarmament, and Father Gallo still hasn't made reparations for his scandalous and awful comments about abortion and euthanasia, both of which he promotes alongside his vociferous political campaigning against Silvio Berlusconi which the aforementioned Father Bozzo was a supporter. It can be supposed that Cardinal Tettamanzi, by tacit approval is, like Don Gallo and Father Paoli, a lover of peace, social-justice, euthanasia and abortion. Didn't you know they go together? Oh my poor Genoa, do you miss me now?